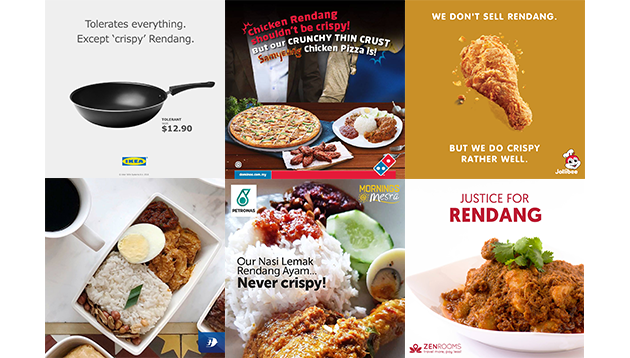 The drama surrounding the crispy chicken Rendang comment made by a MasterChef UK judge has intensified seeing more brands jumping on board the newsjacking bandwagon. On Wednesday, A+M reported on quick thinking Malaysian brands KFC and TGV Cinemas making snarky jabs at the recent #Rendangate drama. This followed after a MasterChef UK contestant was eliminated for her because the skin on chicken Rendang dish was not crispy, comments which he has since backtracked on. Not only did the incident unite netizens from countries across Southeast Asia, where the Rendang dish is widely available, brands across the region, and more widely seen from neighbouring country Singapore, also joined hands in mocking the Rendang comment. From chicken joints, to government agencies, here are the jabs which caught our eye. As one of the first known government agencies to jump on board, the Singapore Civil Defence Force (SCDF) also took the opportunity to make a friendly public service announcement to home chefs who leave their cooking unattended. The witty post featured a burnt ‘crispy’ Rendang, and statistics that the SCDF attended to 402 fires last year caused by unattended cooking. The post garnered over 2,200 reactions, 3,700 shares and 312 comments at the time of writing. This post garnered around 244 reactions, 347 shares and 52 comments at the time of writing. Singapore budget airline Scoot, known for its jabs, also weighed in on the action by promoting its flights to Indonesia and Malaysia. Also referencing April Fool’s Day, the post garnered around 209 reactions, 25 shares and 12 comments at the time of writing. Like many others, chicken joint 4Fingers also took the opportunity to promote its crispy fried chicken, touting itself the “original fried chicken” while tagging MasterChefUK. The post garnered around 1,300 reactions, 120 shares and 23 comments at the time of writing. IKEA took the opportunity to promote its frying pan product, aptly named “Tolerant”, to show its ability to be adaptable in all forms of cooking. This was coupled with the caption in the photo which read “Tolerates everything. Except ‘crispy’ Rendang”. The post garnered over 7,400 reactions, 7,800 shares and 755 comments at the time of writing. Next to hop on the fried chicken train was Filipino brand Jollibee, which took the opportunity to promote how crispy its one of its signature fried chicken was to the masses. This post garnered over 1,800 reactions, 571 shares and 90 comments at the time of writing. On home turf, homegrown airline MAS added spice to the crispy conversation, taking a dig by assuring its chicken Rendang is “non-crispy”. MAS encouraged netizens to come on board its airline to taste its nasi lemak dish. This post garnered over 4,700 reactions, 2,000 shares and 329 comments at the time of writing. The next fast food brand to take a swipe was Domino’s Pizza Malaysia, which took the chance to promote its new line of Korean-inspired pizzas with a crunchy crust. This post garnered over 1,400 reactions, 92 shares and 31 comments at the time of writing. Food-delivery app foodpanda has also gotten in on the action by being a little educational. In a caption of a picture of Rendang, the brand explained the slow cooking method of Rendang, debunking claims that Rendang should be crispy. Burn. This post garnered 102 reactions, 14 shares and 10 comments at the time of writing. Oil and gas company Petronas also weighed in, by putting out a picture of Nasi Lemak Ayam Rendang and clarifying that it should not be crispy. This post garnered over 1,300 reactions, 911 shares and 75 comments at the time of writing. With a bold proclamation such as “Justice for Rendang”, ZEN Rooms took a chance to ask netizens to book a room with them to countries such as Malaysia, Indonesia and Singapore. This is to experience what chicken Rendang is supposed to taste like. Another cinema to take the stage is Golden Screen Cinemas (GSC), which took the chance to promote its Sambal-Lah burger, available at its cinema. This included a break down of the burger which contains – surprise, surprise – “infinite chicken Rendang”. This post garnered around 111 reactions, 16 shares and 18 comments at the time of writing. Up next on the crispy chicken agenda is Marrybrown Malaysia, which also referenced its Nasi Marrybrown’s Crispy Chicken product. On Twitter, the post garnered around 70 likes and 52 retweets at the time of writing. Meanwhile, KyoChon Malaysia decided to take the high road, by calling out everyone debating on the issue and encouraging them to come to their outlets instead to have chicken. This post garnered 124 reactions, seven shares and five comments at the time of writing. Secret Recipe Malaysia took a stab to promote its Nasi Ayam Rangup with a Facebook post featuring chicken that is not only spicy and but certainly crunchy. This post garnered over 693 views, 43 reactions and 12 shares at the time of writing. Riding the wave, Agrobank featured a post of the Rendang dish with caption commenting “We don’t have chicken Rendang recipes, but we have a recipe growing up your business.” This post garnered 123 reactions and 112 shares at the time of writing. Instead of plainly targeting chicken, Felda Global Ventures (FGV) jumped in to promote its Saji Cooking Oil which claims to be able to whip up both Rendang and crispy chicken, but not crispy Rendang chicken. This post garnered 60 reactions and 16 shares at the time of writing. So which #Rendangate stunt was your favourite? Share with us your thoughts in the comments. Research agencies: A marriage or a fling? How is AIA’s reputation affected by its fake plan scandal? How much will AIA's legal tussle over a fake plan hit the firm's reputation?.. In a recently conducted YouGov study of the content viewing behavior of Filipino consumers, it was revealed that more than one in ..
Telco price war: A sign of maturity for the market? The agency won the NGO's e-commerce website redesign and its launch media campaign. ..